I specialise in the repair, restoration or complete replication of original Georgian, Victorian and Edwardian joinery. If replacement is unavoidable then doors and windows in old houses don't have to be made of plastic, aluminium, or other modern factory product, or tropical hardwood from dubious sources. You can have the real thing - joinery with entirely traditional design, details, construction and materials - at prices that are very competitive with factory-made windows and doors. Traditional joinery looks right. Nothing spoils the appearance of an old building so much as the intrusion of inappropriate windows and doors. Properly made natural wood windows and doors are of supremely high quality and long-lasting. Millions of sash windows and panel doors are still in good condition after 100 or more years. Where they are no longer in good order this is invariably due to neglect. They may previously have functioned perfectly for many years. Imagine a 100 year old plastic window! The promises made for factory products, that they are "low maintenance" or"no maintenance", usually means"unserviceable after the guarantee has expired". Within 20 years most will be obsolete and in need of complete replacement. The higher initial cost of real joinery is soon offset by its long life; given reasonable maintenance it will last indefinitely without the need for total replacement. Traditional joinery is environmentally friendly; I use no plastic, tropical hardwood or preservatives and I use North European (usually Swedish) redwood which is from environmentally friendly sources. 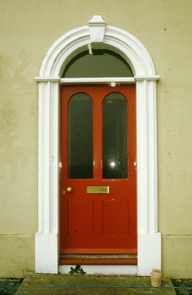 I can make and fit a precise copy of any door, window or other joinery item. If already missing I can derive a design from appropriate examples in the neighbourhood or from our extensive experience of many different designs. I can copy any design of skirting, architrave, other moulding or turned work such as stair balusters. Most of my work since I started in 1987 has been the repair or replacement of hundreds of sash windows which dated from about 1790 to 1905, but I also do a variety of other joinery work and welcome the opportunity to look at other interesting projects . Eighteenth and 19th century joinery is not merely antique or quaint but usually is also beautifully designed and constructed so that it is difficult to improve upon. This is not so suprising if you look at the background. 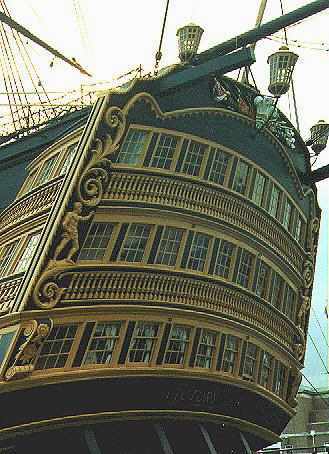 Spectacular joinery on the stern of HMS Victory. Was the sash window a by-product of military technology? These centuries are thought of as the age of iron and steel but this was also the age of wood. Wood technology, mainly in forms of transportation - boats, ships, carriages and carts - reached a level of size, complexity and sophistication as never before, for example, 19th century sailing ships were the largest and most complicated wooden items ever built. Wood manufacturing was a huge and highly skilled industry with diverse products developed and refined by long unbroken traditions. Architectural joinery was part of this tradition. Sash windows and other joinery items are in fact highly sophisticated both visually and functionally which is why so many of them are still in service, sometimes 200 or more years old. 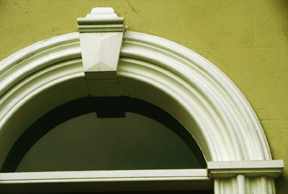 The idea of conservation without alteration or `improvement', is taken for granted with other antique items such as furniture, but joinery is often less highly regarded even though a large Georgian sash window with its associated folding shutters, panelling and architraves, is quite likely to be the most elaborate and refined artifact in a house. A new sash window is reasonably draughtproof if properly designed and detailed, and there is plenty of scope for improving the performance of old windows without having to use plastic brushes or other `high-tech' methods. Perfect draughtproofing is undesirable; modern sealed windows are required by building regulations to have a vent as many problems are associated with poor ventilation. A small level of draught is desirable for the health of both the building and its occupants. Draught brushes are usually fitted into machined slots; these are likely to shorten the life of the window by providing access for water by capillary action. Why build in obsolescence? To seal a sash window at the meeting rails or at the bottom rail creates another problem in that these are the points at which condensation drains off to the outside. Water then will accumulate and cause rot in the woodwork. Why build in obsolescence? The various plastic proprietary products on offer all have a short life and will soon need replacing. This may be difficult as the particular profile or design needed might have become obsolete. Why build in obsolescence? 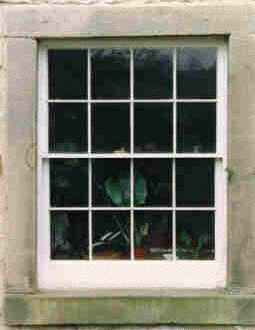 It is impossible to double glaze a traditional sash window without spoiling its appearance, due to the deep rebates and larger sections of glazing bars demanded by double glazed units. A double glazed sash is very heavy and hard to move, and requires bead glazing which is ugly and not durable compared to putty. Double glazed units tend to fail - they are dependant on an adhesive seal around the edge and these eventually become brittle and fail, allowing moisture into the cavity and so needing replacing. The combination of double glazing and draught sealing create a problem, particularly in old buildings - humidity levels are kept high causing condensation problems such as damp mouldy patches on walls. 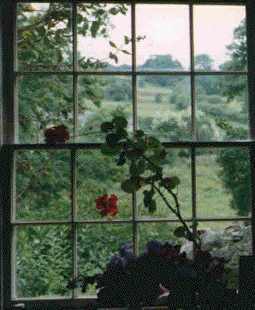 Single glazed windows function as de-humidifiers - allowing condensation to collect and drain off to the outside. Preservatives are usually unnecessary. Timber "preservation" businesses have successfully created anxiety and panic in householders encountering signs of wood-worm or wood-rot. Their reaction is to impregnate the whole building with very toxic materials. However all old buildings show signs of insect and fungus attack including the dreaded dry-rot. This usually has occurred either when the building was younger and timber had not fully dried out and may well have been defunct for many years, or when buildings are neglected and left damp and un-heated. Eliminating damp and introducing heating and ventilation usually will eliminate insect and fungus attack. The heavily moulded surround is a precise replica of the original, involving careful spindle-moulding work with our own hand-made cutters and jigs. The door itself was missing so this design was derived from an existing internal door. We have closed our workshop at Via Gellia Mill and temporarily ceased trading pending the opening of our new workshop in Middleton. This may take some time as extensive alterations and sound-reducing measures must be in place before we can re-open.